Move your mouse over the image to zoom in. 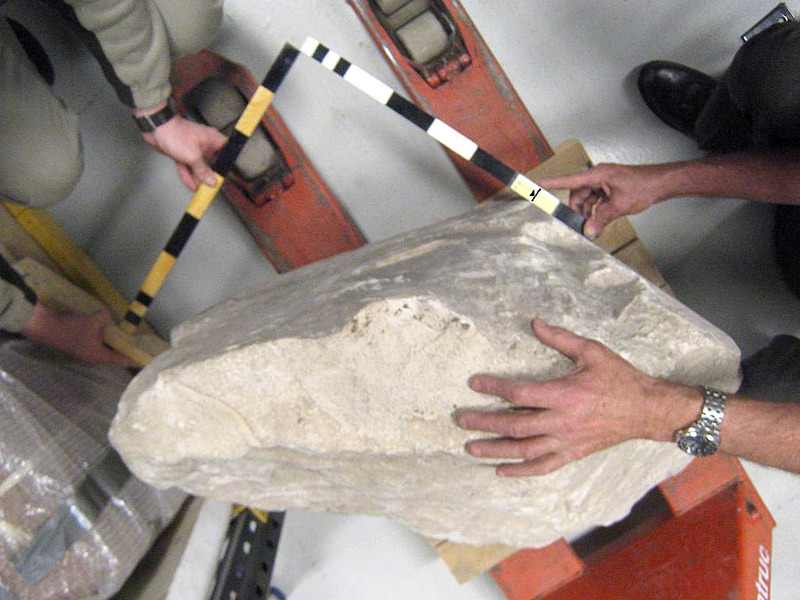 In the collection of the National Museum of Scotland in Edinburgh is an unusual artefact; a block of limestone, roughly hewn and damaged in places, and weighing around half a metric ton. The stone is of remarkable historic and scientific significance. Around 2,600 B.C.2 it was cut from the bedrock, shaped and sized in the RA-Aw quarries, now known as the Tura quarries (they are still accessible in the hills overlooking the east side of the Nile valley just south of modern day Cairo). The stone was then transported 15 km across the river valley to the largest pyramid ever built in Egypt, the Great Pyramid of pharaoh Khufu at Giza, where it was raised and placed on its outer face. Incredibly, a written record of the journey these stones took to Giza has survived.3 In 2013 fragments of a 4th Dynasty papyrus from the 26th or 27th year of the reign of pharaoh Khufu were recovered from the Wadi al-Jarf on the west coast of the Red Sea, where an Old Kingdom port is being excavated. The papyrus fragments that the joint Franco-Egyptian team4 uncovered turned out to be the oldest ever found. Furthermore, the hieroglyphs written on one of them describe the transportation of stone blocks from the Tura quarries, across the Nile to the Pyramid of Khufu at Giza. As the high quality stone from the Tura quarry was reserved for use on the outer faces of the pyramids, the stones they described moving were surely casing blocks, and the stone in Edinburgh could therefore be one that was transported by the team described in the text. ‛Day 26. Inspector Merer sailed with his team from Tura [south]; loaded with stones for the Horizon of Khufu;6 passed the night at the Lake of Khufu. Day 27. Sailed from the Lake of Khufu; navigated to the Horizon of Khufu, loaded with stones; passed the night at the Horizon of Khufu. Day 28. Sailed from the Horizon of Khufu in the morning; navigated back up the river to Tura [south]. The content of this papyrus then is a daily diary of work carried out by Inspector Merer and his team during the construction of the Great Pyramid of Giza. It describes events just like the ones that would have brought the Edinburgh stone to Giza. It is incredibly fortuitous to have recovered this papyrus, but information regarding the stone is not only derived from ancient texts. Archaeological information about the Ancient Egyptians and their construction methods can also be derived from examining the stone itself. The Ancient Egyptian monument on which it was placed and the tools and techniques they used to build it also provide valuable information about the Old Kingdom culture and the technologies it developed. In April of 2013 I was able to carry out a study of the casing stone in Edinburgh with permission granted by National Museums Scotland.7 That study yielded new data, new architectural information, and improved understanding of an issue of more profound cultural significance. 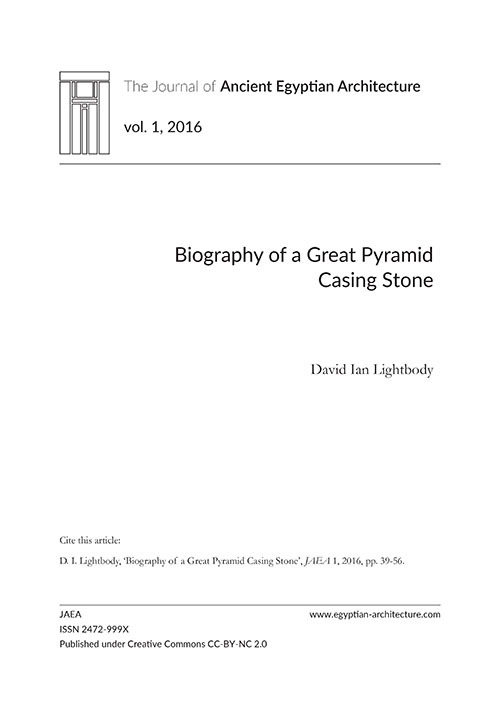 In this article I summarize the motivations of the man who had the stone brought to Edinburgh in 1872, Charles Piazzi Smyth, and critique his own analysis of the stone.8 I show that when more appropriately investigated, the stone reveals significant information about its original position on the outside of the Great Pyramid, as well as information regarding the Ancient Egyptians’ own systems of measurement. Finally, I address the symbolic significance of the principal dimensions of this stone, and the monument on which it was placed. I explain how the dimensions and proportions of the block and the building were most likely related to the geometric proportions of a circle, and I explain what this architectural symbolism would have meant to the Ancient Egyptians. This phenomenon was the issue which first attracted the English Egyptologist Flinders Petrie to study the architecture of Egypt and the Giza necropolis in particular. He addressed it at length in his report of his 1883 survey of Giza.9 Here I offer additional explanation to clarify aspects of this long standing investigation. Fig. 1. The Casing stone illustrated in the 1873 Harper’s Weekly article (January 11, 1873), along with tool artefacts. Public domain image. The casing stone addressed by this study is NMS collection museum catalogue number A.1955.176. We studied and took measurements of this piece in the museum storerooms in April 2013. Casing stones have an angled front face that formed the flat outer surface of the pyramids and I was interested to establish if its face slope matched the angles calculated elsewhere for the Great Pyramid of Giza, from the building itself, and from surviving casings stones. The casing stones are trapezoidal in form when viewed from the side, as opposed to core blocks which were most likely left roughly hewn and approximately cuboid.10 If the slope of any casing stone’s outer face is accurately known then the side slope of all of the pyramid’s faces are known, and so these casing stones are of particular interest to archaeologists studying pyramid architecture, as was the case with Smyth and Petrie. Fig. 2. The casing stone in the NMS stores, with the outer face orientated to the top of the image. Author’s image. Based on the type of limestone used and its associated architectural function, this casing block was most likely mined at the Tura quarries on the east side of the Nile around 46 centuries ago, carefully shaped with copper tools, shipped across the river to Giza on the west bank, dragged up to the pyramid construction site on a wooden sled, and lifted into place on the outside of the Old Kingdom pyramid of pharaoh Khufu using methods that remain obscure. Its outer face may have been worked again in-situ to ensure it was finished flush with the rest of the pyramid’s external surface. Forty-four centuries later, the stone was found in the mounds of debris on the north side of the Great Pyramid of Khufu by Waynman Dixon in 1872. Its original architectural position on the pyramid was unknown at the time it was collected from the site. Dixon was an English engineer who carried out investigative work at Giza for Charles Piazzi Smyth.11 At the time, Smyth was Astronomer Royal for Scotland, based in Edinburgh, where he carried out research into many different scientific and historical issues. Almost all of these casing stones were stripped off the pyramid in the ancient past as they were made from high quality stone and were useful for building the city of Cairo and for producing limestone mortar. Only a few oversized base level casing stones remain in situ at the Great Pyramid. The example in the NMS collection found by Waynman Dixon is not from the base level and is therefore unique in several respects. 51 cm from front to rear on the top. A large section of the back and lower rear face of the stone is broken away and so its approximate weight is calculated to be around 500 kg. 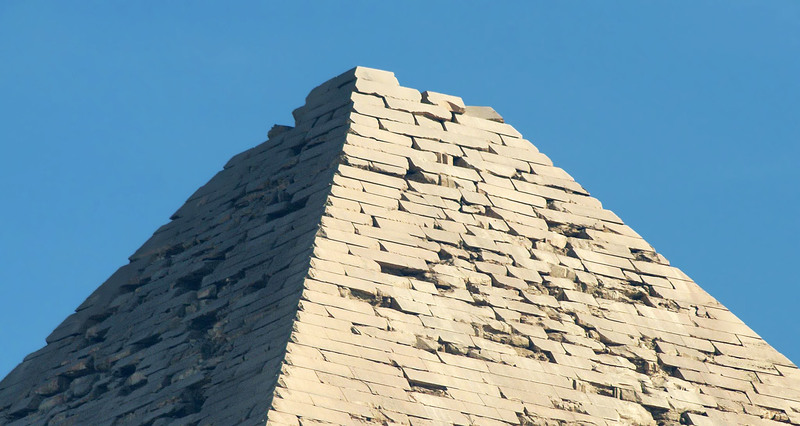 Although it remains in one solid piece, the casing stone is substantially chipped around the edges and corners, probably due to having been pushed down the pyramid in the ancient past. Three all-important worked flat faces are partially intact and in good condition in places, a fact that was also noted by Smyth. 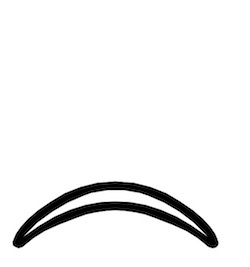 These three surfaces are the flat base, the sloped front face and the flat top. This means that fairly accurate measurement of its original, intended primary dimensions, and its intended slope angle, can be made; something that Smyth achieved and we were able to repeat. Our angular measurements showed that within our margins of error (+/- 0.25°), the face of the stone, when compared to the upper and lower flat surfaces, and hence the horizon, is at the correct angle known for the Great Pyramid’s faces, of around 51.84 degrees.12 The limestone of the block is still surprisingly bright in color, almost silvery, particularly the limestone dust that has accumulated on the surface over time. The Tura limestone from south of Cairo is thought to have been utilized because it is a light colored stone suitable for the outer faces of monuments. These two facts; the slope angle and the geological material, indicate that the NMS stone is a genuine Giza casing stone, and is the same stone studied by Smyth over one hundred years ago. Authentically sized standard cubit replicas were also used to measure the incline of the stone’s face (Fig. 2). We simulated using the seked slope measuring method devised by the Ancient Egyptians themselves to check the face. The cubits were employed on the basis that practical experimental archaeology, using techniques from the ancient past, often reveals aspects of materials that otherwise remain hidden. During the Old Kingdom the Ancient Egyptian cubit standard was 52.37 cm long +/- 2 mm.13 This value was very consistently maintained with only a couple of millimeters of variation, particularly when it was utilized to build monumental architecture during the Old Kingdom. The standard cubit was subdivided into 7 palms of 4 digits each, giving 28 digits in total. 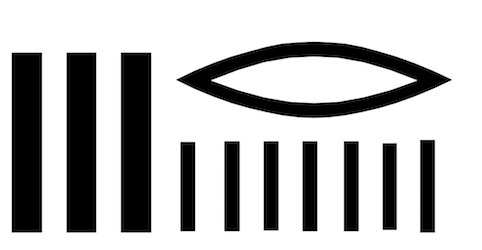 This cubit was known as the mH nswt, written as follows meaning the royal, pharaonic or official cubit. The slope measurement system employed by the Ancient Egyptians was a ‘rise and run’ method known as the ‘seked’ system, written as follows sqd . Textual evidence of the use of this system dates back to the Middle Kingdom. 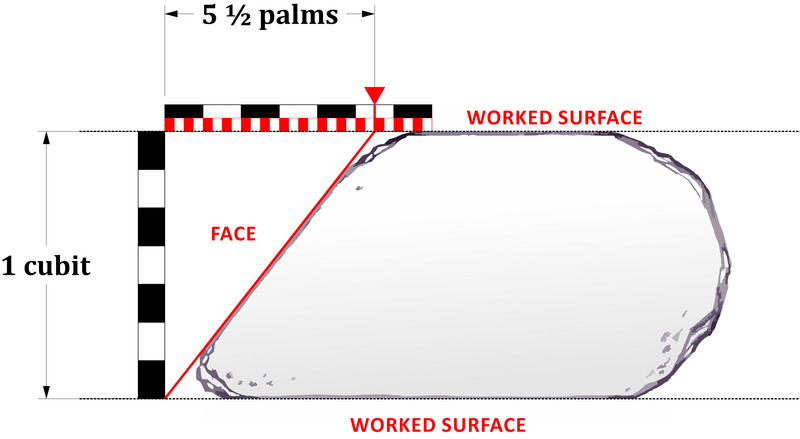 Angular slope measurement was made by measuring the linear horizontal offset, in palms, for each 1-cubit vertical rise. For example, a cubit has 7 palms, so a seked of 7 is 45 degrees. Fig. 3. Measurement of the seked slope of the block face using replica cubit rods. Animation 1. Animation showing the slope measurement of a regular-sized block. Animation 2. Animation showing the slope measurement of a small block. Animation 3. Animation showing the slope measurement of a large block. The known seked of the Great Pyramid equates to 5 1/2 palms. Before we started the study this value was marked off on one cubit to be held along the horizontal top surface, while the other was to be set vertically, at right angles to the first. This formed a right angled triangle with a hypotenuse sloped at a seked of 5 1/2. This seked corresponds to 51.84 degrees from the horizontal, the known ‘pyramid angle’. During this measurement it immediately became apparent that the triangle fitted the sloped face and the block precisely, not just in slope but in height, and so indicated that the casing stone was exactly 1 cubit thick in height, something that was not noted by Smyth (Fig. 3). Why did Smyth not notice this fundamental relationship ? Going by Smyth’s publications this was because he was pre-occupied with the width of the stone, from side to side, as his own now-falsified theories were focused on measurements along that axis as of potential significance. It nevertheless seems strange that Smyth should not have noted that the height was 1 Egyptian cubit, but solid information regarding the real cubit standard and measurement techniques used by the Ancient Egyptians was not readily available during his lifetime, and the issue of measurement standards remained confused in several important respects. Heavy though this casing stone is, it is small compared to the giant sloped stones still in place along the northern side of the base of the Great Pyramid. Most of the fine Tura casing stones were stripped off the Great Pyramid and recycled to build Cairo during the medieval period, but a few of the huge base row remain in place, where they were protected under mounds of fragmented stone that gathered along the edges of the pyramid over the centuries. Given the discrepancy in size between the surviving Giza base stones and the smaller stone in Edinburgh, the first question I addressed was whether or not this smaller stone was actually from the Great Pyramid at all, or if it came from one of the similarly proportioned queens pyramids nearby. They were constructed at the same time as the Great Pyramid (or shortly after) around 2,550 B.C., and to the same slope angle,14 but were built using casing blocks of around this smaller size. Fig. 4. Height of each of the 175 layers of the Great Pyramid measured, from bottom, left, to top, right. Surviving casing stones still in place on the upper levels of pharaoh Khafre’s pyramid, however, demonstrate that smaller casing stones were also used near the peaks of the larger structures. As Lehner described with respect to the second Giza pyramid of Khafre,15 ‘the casing stones at the top of the pyramid are much smaller – about 1 cubit thick (c. 50 cm/20 in)’. It was not just the casing stones that were smaller towards the summits of the pyramids. During his 1883 survey Flinders Petrie measured the height of every individual layer of the core blocks of the Great Pyramid, at the north-eastern, and south-western corners,16 from the base to the current summit. His data clearly show that as the summit is approached the height of the core layers tend closer and closer to 1 cubit in thickness. Fig. 5. Casing stones still in-situ near the summit of the Pyramid of Khafre at Giza, showing a high degree of regularity which may have contributed to their structural integrity and survival. With permission © Franck Monnier. The graph (Fig. 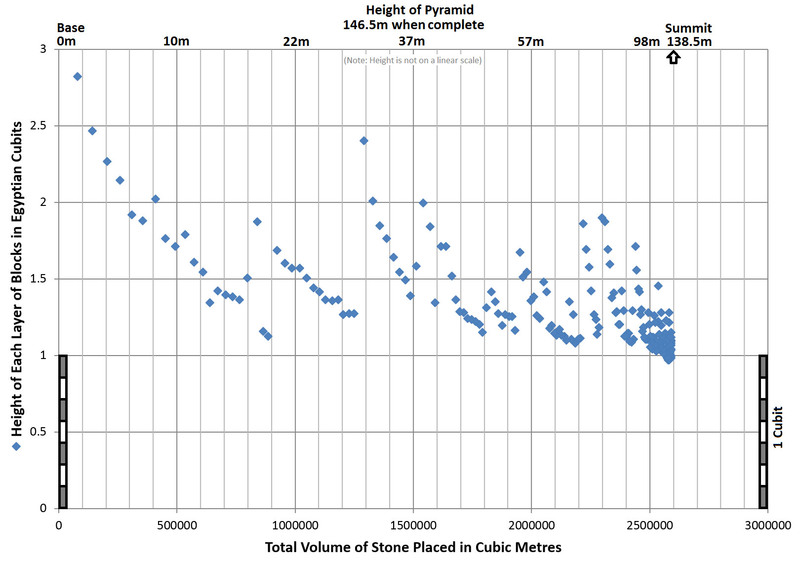 4) provides Petrie’s data in a format whereby the total volume of blocks set in place is plotted against the height or thickness of each layer, as the pyramid was built, from the ground level (left) to the summit (right). The layer heights clearly trended in cycles. This is most likely because the core blocks naturally varied in height due to the varying heights of the stratified layers of rock in the quarries. The stones could be excavated out in layers more easily if the natural stratigraphy was followed. They were then gathered and grouped on-site by size and sorted into a sequence each year, ready for the transportation workforce to become available. Although still unverified, it is though that the transportation teams worked on a seasonal basis and only became available once the agricultural work in the fields by the Nile was completed. When the transportation workforce arrived during the inundation, when agricultural work was impossible, the larger blocks would be sent up to the pyramid first, working down to smaller blocks as the teams tired towards the end of each construction season. The cycles apparent in the stone height dimensions on the graph therefore correspond to a period of one year, so that it would have taken around ten or eleven years to set the core block layers in place. The height of the fine Tura casing blocks would not necessarily have matched the roughly cut core blocks (which were quarried closer to the site) in size, but as the summit was approached it appears that more control and consistency was required over the form of each layer, perhaps because the elevation of the blocks became increasingly hazardous (Fig. 5). The reducing magnitude of the pyramidal form would also have been more sensitive to dimensional variations. As a result, smaller core and casing blocks were cut to size as the summit was completed, tending closer and closer to a precise 1-cubit thickness. But why did sizing of stones so clearly stop at a 1-cubit minimum? One explanation derived from our experiment is that if pairs of cubits were used to measure out and then check slopes of casing stones using the seked system described above, then the blocks must be at least 1 cubit in height. Measurement from the top of the vertical cubit, at right angles horizontally towards the face, cannot be carried out if the stone is less than 1 cubit in height, because the horizontal cubit will not meet the top or front face of the stone. Hypothetically, the quarry workers would typically have used pairs of cubits in large numbers for rapid every-day measurement of dimensions and angles, to cut the stones to the approximate size for transport, with occasional plumb bob checks. More accurate plumb-levelled angle measurement using cubits may have been reserved for the finishing of the casing stone faces after installation on the pyramid, using the methods shown in the diagrams and animations associated with this article. Triangular templates pre-cut to the correct angle may also have been used.17 These templates may have been 1 cubit in height if they were made using cubits, but in fact no such triangular tool has ever been recovered. The ease of manufacturing fairly accurate cubit measuring rules, by simply copying an existing cubit of known dimensions, is an important factor to consider when dealing with an industrial-scale quarry site which was producing enormous numbers of stones. Plumb bob tools that could be used in combination with cubits have been found, but it is perhaps unlikely that these were widely used in the quarry. It is likely that the cubit was the primary measurement tool for both linear and angular measurement used throughout the quarry, with more accurate finishing completed at Giza. The stone in Edinburgh then is most likely a rare survivor; an upper level casing stone from the top of the north face of Khufu’s pyramid, perhaps dropped, lost or forgotten during removal in Antiquity or the medieval period. This stone, however, is not ‘approximately’ 1 cubit tall, it seems to be precisely 1 cubit tall. This level of precision would fit well with the exceptional standards of quality evidenced by the rest of the architectural and archaeological remains of the Great Pyramid, internally as well as externally. It is possible that several layers of the uppermost levels of casing stones of the Great Pyramid of Khufu were constructed to be precisely 1 cubit tall, to make finishing the peak of the pyramid a more controllable process and to ensure that high levels of precision could be maintained over the final form of the structure (Fig. 6). Despite some uncertainty over the exact metrical and construction methods used, it is possibly to say that the Edinburgh casing stone was originally placed near the summit of the monument. As the stone’s outer dimensions are known, its original weight when placed there can also be calculated. Its volume when complete was first calculated and then multiplied by the known density of Tura limestone. This gives a result of 650 kg. This is significantly less than the 2.5 tons usually estimated for regular core blocks, but it remains a very substantial weight. We can only imagine the challenges involved when maneuvering the stone towards the outer edges of the upper levels of Khufu’s Great Pyramid, at a height approaching 146 meters over the desert below. Fig. 6. 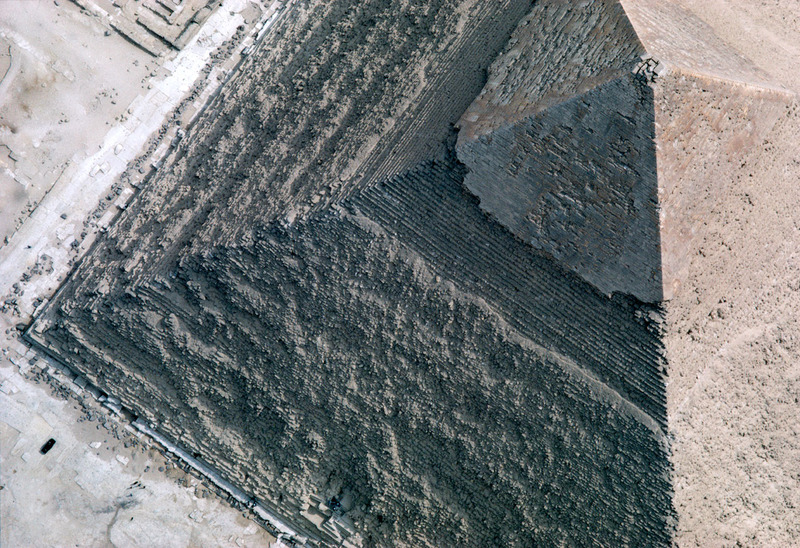 Aerial view of the casing stones and upper levels of the Pyramid of Khafre. With permission © Kazuyoshi Nomach. The upper layers of this pyramid indicate that a more sophisticated construction method may have been used as the height increased and the summit was approached. A fairly clear horizontal line separates two possible zones of construction. The image (Fig. 2) and the diagram (Fig. 3) above reconstruct the seked triangle used by the Ancient Egyptians to control the slope of the face. Our experiment demonstrated that the block is exactly one cubit in height and the face offsets by 5 1/2 palms at the top, and so it corresponds exactly with the ‘pyramid angle’ of the Great Pyramid, and it embodies the very definition of a seked18 of 5 ½ . Knowledge of the seked system only came after Smyth’s time, thanks to a discovery made by the Scottish antiquarian, Alexander Henry Rhind.19 In 1864 Rhind was offered a unique papyrus recovered from the West Bank of Thebes that contained some of the oldest mathematical calculations known in human history. Rhind unfortunately died as he brought the mathematical papyrus back to Europe, but it did complete the journey and is now known as the Rhind mathematical papyrus (RMP). It took several decades to understand, translate and publish the content and so Smyth was never familiar with it. It contained many examples demonstrating how to approach typical arithmetic and geometric problems, including how to calculate the required and measured slope face of a pyramid. Using straightforward procedures, the Rhind papyrus showed how the side slope of a pyramid’s faces can be defined numerically.20 The technique is comparable to modern day degrees and angles, or inclines quoted in percents that are used on road signs for steep hills. According to the Rhind Mathematical Papyrus, a seked slope consists of the number of palms moved horizontally for each 1-cubit rise. The examples indicate that the Ancient Egyptian method normally began with the architects choosing the desired base and height dimensions for the pyramid, measured in Egyptian standard cubits. They then worked out what the associated slope value or seked was. It was not usually the seked that determined the base and height dimensions,21 and so we must look to other reasons for why the choices of overall outer dimensions and proportions were made. Smyth, Petrie, and Agnew and Taylor before them, and many modern day Egyptologists, including the National Museum of Scotland’s previous curators, have noted that this angle, a seked of 5 1/2, not only corresponds with the slope of the Great Pyramid’s faces, but is the precise slope required to give the building proportions that match significant proportions of a circle.22 The observed geometric relationship is as follows: a circle formed by using the height of the pyramid as a radius, precisely equals the length of the pyramid’s perimeter at ground level. This relationship only holds for a pyramid of this precise slope. The basic data that can be used to test this relationship for the Great Pyramid was first accurately derived from Petrie’s survey and is as follows: The original form of the completed building was 1760 cubits around and it was 280 cubits in height. Petrie discussed the proportions at length in 1883 and in several later publications.23 Later surveys have confirmed the accuracy of Petrie’s 1883 survey results, with only small adjustments,24 and data derived from surviving base layer casing stones also agree with the conclusions reached by Petrie and others who followed. Fig. 7. Surviving annotated redundant display cards from the stone’s time in Edinburgh. With permission, NMS. Display cards saved by National Museums Scotland (Fig. 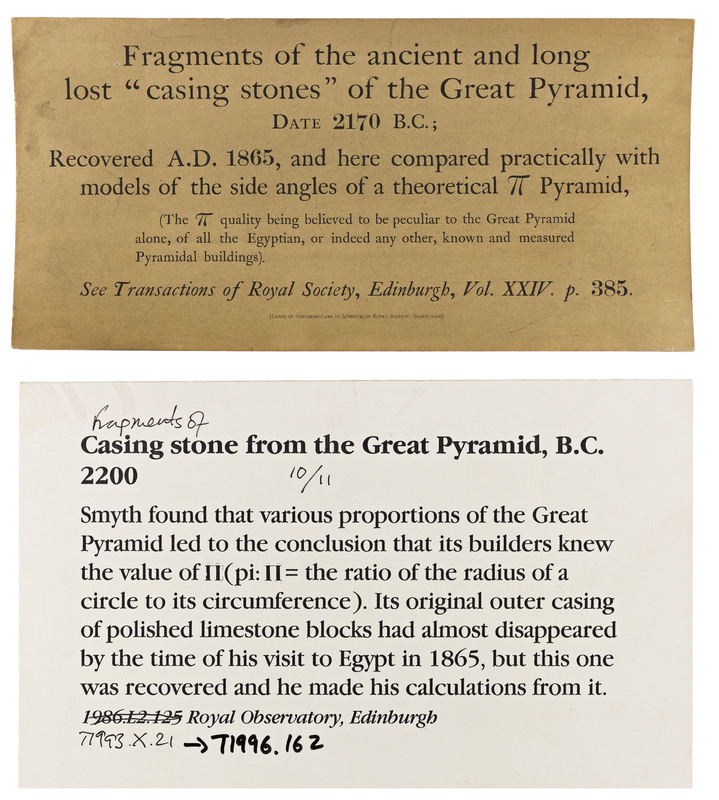 7) show what the curators thought of the stone over the years since it arrived in Edinburgh, including their evolving estimates for the date of construction of the Great Pyramid (2,170 B.C. and 2,200 B.C. compared to today’s estimate of 2,550 B.C. to 2,600 B.C.). The curators were clearly aware of the circle-related proportions represented by the slope of the block’s face, and that Smyth had investigated this issue, something they refer to as a characteristic of a ‘theoretical pi’ pyramid. This phrase is, however, a rather unfortunate term, derived from Smyth’s own discussions, as the abstract ratio pi is not something that is applicable within the Ancient Egyptians’ practical construction and measurement context, or within their mathematical systems. As will be discussed, it is most likely that they used a multiplication factor of 3 1/7th rather than an abstract ratio. After studying this issue in some depth for over a decade, I have tried to understand what the inclusion of circular proportions in the principal dimensions of rectilinear buildings would have meant to the Ancient Egyptians themselves. I argue that this architectural phenomenon fits well within a wider cultural context that was of distinct ritual significance during the Old Kingdom, and which built on the Predynastic and Early Dynastic cults of Hierakonpolis. My research results indicate that the special proportions manifest a deep-seated belief in the active power of encircling protective and purifying symbolism,27 perhaps to the extent that the Ancient Egyptian architects felt that it bestowed actual structural strength and integrity on the monuments they designed. The application of circular proportions around the granite ‘king’s chamber’ and around the perimeter of the pyramid of Khufu suggest that the architects intended to encircle and protect these enclosed spaces. Iconographically this symbolism seems to have been represented by the shen rings, often carried by the royal avian guardians Horus and Nekhbet. In later periods, entrances to sacred temple enclosures (temenos areas surrounded by peribolos walls), were often overlooked by the avian figures of Horus or Nekhbet, with wings spread and carrying the shen rings. Lintels spanning the doorways into these temenos areas often had the royal raptors carved onto their undersides. The ‘shen rings’ carried by the pharaoh’s own patron god represented the encircling royal protection of the falcon Horus and his built structures. Horus protected the pharaoh and his buildings and Egypt was his protectorate. The pharaoh was linked to the heavens through this avian symbolism, where he was associated with both the shen ring and the solar disk. The pharaonic theme of the gyring, vigilant, falcon above ultimately drew its inspiration from the natural world, but was used as a metaphor for protecting the institutions of pharaonic rule. Through these special motifs in the architecture of his monuments, Khufu separated himself and planned to move above his compatriots. It was a restricted form of propaganda that elevated the pharaoh above even his closest advisors, such as Hemiunu and prince Ankhhaf who helped design and build his monument.28 The encircling symbolism expressed in the architecture was also expressed graphically on portable material culture belonging to the cults of the Ancient Egyptian pharaohs of the Old Kingdom, such as on crowns, royal statues and fine furniture.29 Recently I showed how the apotropaic symbolism was represented on a series of high status vases decorated with avian themes including Horus carrying the shen rings. These vases were used within the pyramid complexes of the pharaohs.30 I argued that during the Old Kingdom, although these symbols were ubiquitous within royal cult mortuary contexts, they were used discretely. The Egyptians performed ritual circumambulations (dbn, pXr) of monuments for many important occasions. Ritner described the centrality of the circumambulation rite within the Old Kingdom pharaonic culture as ‘striking’.31 The encircling symbolism is most clearly attested textually with respect to pyramid architecture in Pyramid Text 534.32 This is a spell or prayer of encirclement, protection and purification for the pyramid and its temple, written on the walls of the entrance passage into the pyramid of Pepi I at south Saqqara. In this text the phrase PT 534 §1277c includes the term ‘the pyramid and temple are encircled’ ‘for Pepi and for his Ka’. The first two glyphs, V7 and N35, form the syllables of the word for encircled, shen, Snw. These are the same signs used to write the name of the shen ring; a word also used for the cartouche which encircled and protected the pharaoh’s name. As the Old Kingdom proceeded, the primary vehicles for expressing pharaonic funerary symbolism evolved towards pyramid texts, statuary and iconography rather than monumental architectural proportions. Political power started to decentralize away from the pharaoh.33 These changes help to explain why the later pyramids and solar temples employed various different dimensions and proportions, more appropriate to their own unique historical contexts. There was no one-rule-fits-all, but the same underlying ideas and symbols were subsequently recycled time and again, in an increasingly retrospective legitimation process. Smyth (1819-1900) originally came into contact with the issue after reading a book by English author and publisher John Taylor, published in 1859. One of the first authors to write extensively on this matter,34 Taylor had printed H.C. Agnew’s original thesis discussing the circular proportions of the pyramids of Giza twenty years previously.35 Taylor’s own lengthy thesis was entitled ‘the great pyramid, who built it and why was it built?’. Smyth was circumspect about Taylor’s thesis when he first read it,36 but later went to Egypt to carry out his own survey of the Great Pyramid. On his return he published his own analysis of the Giza monuments37 and followed this up with several further discussions.38 He acknowledged that he was influenced and subsequently convinced by Taylor’s theories. Smyth and Taylor were both justified in their awe of the architecture of the Great Pyramid, but the conclusions that they drew from the monument’s ancient symbolisms were unfounded and irrational. Although Smyth’s interpretations were mostly incorrect, his theories were widely influential and caused considerable confusion in the United Kingdom and in the United States. It seems that in order to find an explanation for an architectural phenomenon, deeply rooted in an Ancient Egyptian culture which they did not understand, they drew on their own religious and nationalist sentiments, and mixed these with their knowledge of biblical history and current scientific trends. Smyth drew conclusions from the resulting mélange ‘with most wretched logic’39 and decided that the almost perfect proportions were clearly divinely inspired, and that the pyramid was a metrological monument built with a ‘sacred pyramid inch’. Flinders Petrie finally resolved the matter with his 1883 report of his high-precision survey of Giza. In that report he rejected all of Smyth’s theories, and only accepted the existence of the circular proportions, which he concluded had been deliberately included in the building’s original designs. The dimensions and proportions of the Great Pyramid and its building blocks are of significant historical interest, both with respect to the Ancient Egyptian culture and to the history of science during the 19th and 20th centuries. Those dimensions have been surveyed and studied several times in the modern era, at increasing levels of accuracy as modern technology develops. The building’s proportions have been addressed by many prominent Egyptologists, and it was the issue of circular proportions that initially attracted one the greatest of all Egyptologist, Flinders Petrie, to study the architecture of the whole Giza plateau complex in such great detail. The casing block in the National Museum of Scotland’s collection is part of that story, and its particular form exhibits the crucial dimensions and proportions of outstanding historical significance. This new research revealed that the Edinburgh stone is the only known example of a casing stone from the upper levels of the north side of the Great Pyramid of Khufu at Giza; one of the most celebrated buildings ever constructed in human history, and the last remaining wonder of the ancient world. The building’s characteristics continue to exercise the finest minds and the finest scientific instruments in Egyptology today, and it continues to provoke discussion and yield new information regarding Old Kingdom Egyptian symbolism and ritual. The stone’s purpose was to protect the outer face of the Great Pyramid. I have argued that its circle-related proportions were apotropaic in nature, and were integral to the systems of iconography and ritual that supported the pharaonic funerary cults and the structures of pharaonic rule. The Giza casing stone left Egypt almost 150 years ago. It is now also a part of Edinburgh’s historic fabric, in the collection of the National Museums Scotland, and serves as a memorial to the interesting life and work of the late Astronomer Royal for Scotland, Charles Piazzi Smyth. These texts could be construed as evidence contrary to the conclusions based on the architectural evidence, but it is important to understand, as I set out in 2008,41 that these examples are calculations of areas, not circumferences. The problems also use the widths of circles rather than diameters, which must by definition pass through the center of a circle. Gillings42 showed that these calculations on the papyri effectively estimate the area of a square with a width 8/9th of the circular area to be calculated. This does produce an area that is approximately equal to the area of the circle of the specified width, which completes the calculation, but there is no use of a circumference in these calculations, no use of a pi like ratio, or even a diameter, strictly speaking. Above all, there is nothing in these problems to suggest that the Egyptians were aware that circular area and circumference calculations can be related using one common factor, as we do today using pi. This evidence relating to circular areas on the papyri, therefore, does not preclude the existence of a different calculation method that used radii to calculate circumferences.43 Architectural evidence from the monuments, some of which is outlined below, indicates that such a circumference calculation method was based on using the number 7 for the radius or width of a circle, so that its circumference would then be 44 parts, or 22, depending on which was used. These basic numbers work very readily with the Ancient Egyptians’ 7-part cubit system,44 and could have been scaled to whatever architectural dimension was required. Furthermore, in my analysis of 200846 I suggested that the earliest known example of circular proportions in monumental pharaonic architecture, at Saqqara, also used a circular width based relationship: the Saqqara Step Pyramid enclosure wall has an internal north-south dimension of 1000 cubits, while its perimeter is 3,142 cubits around.47 Other values have been quoted for this distance, but none vary more than 0.2 % from this value which is very close to the circumference of a circle of diameter 1000 cubits. An early understanding of a relationship between widths and circumferences of circles at Saqqara then implies that what we see at Giza, where the radius is used, is a slightly later development of the simpler geometric and symbolic relationship first developed for the Step Pyramid enclosure. If this scenario is correct then the basic width/circumference method must have been adapted towards the end of the 3rd Dynasty and early 4th Dynasty to produce a method allowing radius based circular calculations and constructions. Radii based numbers would have been more practical for use when constructing circles accurately using cords attached to a central point. The proportions would also have been more readily adaptable to the basic pyramid form, which was already evolving into a shape close that which allowed incorporation of the radius/height : circumference/perimeter relationship which we see today in Khufu’s structure. Finally, additional supporting evidence can be derived from the Ancient Egyptians’ unit fraction system.51 Using the unit fraction system along with the 7-part cubit for a circular width, it is easy to find that a circumference is very precisely 3 and 1/7th cubits, simply by spinning the cubit around at its halfway point and measuring the described perimeter with a string. 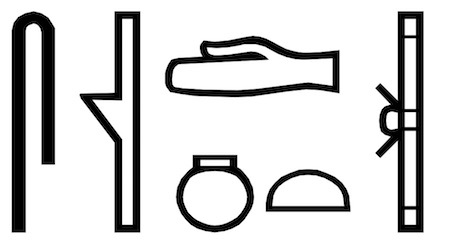 This is written in hieroglyphs as follows: . If this basic circular width/circumference multiplier was adapted for use in radius/circumference calculations, then the whole number 3 and fractional number 1/7th would have been doubled to obtain the factor for calculating a circumference from a radius. This gives 6 + 1/4 + 1/28th in the Ancient Egyptian unit fraction system, and is written as follows in hieroglyphs: . At first sight this seems like a clumsy fraction to use in calculations, but it fits the Egyptian cubit measurement system very well. The 7-part cubit was further subdivided into 28 digits and so a 1-cubit radius circle is also 28 digits in radius. The circumference produced by this 28-digit cubit would then multiply out to be 176 digits in length (28x6 + 28/4 + 28/28 = 176). These numbers are clearly similar to the actual dimensions used for the Great Pyramid, which was 280 cubits high by 1760 cubits around when complete, lending credence to this reconstruction. Petrie also noted that these same proportions and numbers were used in the so called ‘king’s chamber’ of the Great Pyramid, where the width is 280 digits while the perimeters of the north and south walls are 1760 digits, suggesting an effort to incorporate numbers related to the circle, and hence the encircling shen/cartouche symbolism, into and around that most protected of spaces. Anthes, R. (1961), ‘Das Verbum Sni “umschließen, bannen” in den Pyramidentexten’, ZÄS 86, pp. 86-89. Agnew, H. C. (1838), A Letter From Alexandria on the Evidence of the Practical Application of the Quadrature of the Circle in the Configuration of the Great Pyramids of Giza, London: Longman, Orme, Brown, Green and Longmans. Arnold, D. (1991), Building in Egypt. Pharaonic Stone Masonry, Oxford: Oxford University Press. Bárta, M. (2016), ‘“Abusir Paradigm ” and the Beginning of the Fifth Dynasty’, in I. Hein, B. Nils and E. Meyer-Dietrich (eds. ), The Pyramids. Between Life and Death. Proceedings of a Workshop held at Uppsala University 2012, Uppsala: Uppsala Universitet, pp. 51-74. Brovarski, E. (2009), ‘Once More Hr, “Pyramid ”?’, in D. Magee, J. Bourriau and S. Quirke (eds. ), Sitting Beside Lepsius: Studies in Honour of Jaromir Málek at the Griffith Institute, Leuven: Peters, pp. 99-114. Brück, H.A. and Brück, M. (1988), The Peripatetic Astronomer: The Life of Charles Piazzi Smyth, Bristol: Hilger. Chace, A. B. (1929), The Rhind Mathematical Papyrus, Ohio: Oberlin. Cole, J. H. (1925), The Determination of the Exact Size and Orientation of the Great Pyramid of Giza, Cairo: Survey of Egypt. Cooper, L. (2010), ‘A New Interpretation of Problem 10 of the Moscow Mathematical Papyrus’, Historia Mathematica 37, pp. 11-27.
Cooper, L. (2011), ‘Did Egyptian Scribes Have an Algorithmic Means for Determining the Circumference of a Circle?’, Historia Mathematica 38, pp. 455-484. Dash, G. (2016), ‘The Great Pyramid’s Footprint: Results from Our 2015 Survey’, AERAGRAM 16(2), pp. 8-14. Edwards, I.E.S. (1979), The Pyramids of Egypt, Penguin. Faulkner, R.O. (2007), The Ancient Egyptian Pyramid Texts, Kansas, pp. 201-202. Gillings, R. (1972), Mathematics in the Time of the Pharaohs, New York: Dover. Gilmour, C. (2015), 'Alexander Henry Rhind (1833-63): A Scottish Antiquary in Egypt', Proceedings of the Society of Antiquaries of Scotland 145, pp. 1-14. Lauer, J.-Ph. 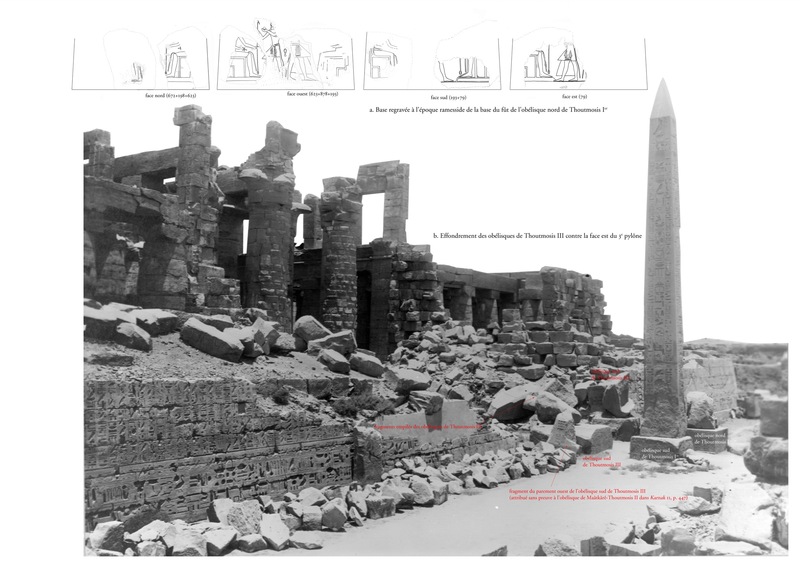 (1931), ‘Étude sur quelques monuments de la IIIe dynastie (pyramide à degrés de Saqqarah)’, ASAE 31, p. 60. Lehner, M. (1997), The Complete Pyramids, London: Thames & Hudson Ltd.
Lepsius, K. R. (2000), The Ancient Cubit and its Subdivisions Expanded and Edited by Michael St. John, London: Museum Bookshop Publications. Lightbody, D. I. (2008), Egyptian Tomb Architecture: The Archaeological Facts of Pharaonic Circular Symbolism, Oxford: British Archaeological Reports International Series and Archaeopress. Lightbody, D. I. (2012), ‘The Encircling Protection of Horus’, in H. Abd El Gawad , N. Andrews, M. Correas Amador, V. Tamorri and J. Taylor (eds. ), Proceedings of the Twelfth Annual Symposium Current Researches in Egyptology, 2011, University of Durham Oxford, Oxbow, pp. 133-140. Lightbody, D. I. (2016), ‘The Encircling Motifs of Old Kingdom Avian Themed Pharaonic Vases’, GM 249, pp. 111-123. Maragioglio, V. and Rinaldi, C. A. (1965), L'architettura delle piramidi Menfite 4. La Grande Piramide di Cheope, Text, Rapallo: Tipografia Canessa. Miatello, L. (2008), ‘A Solar Rule in the Architecture of Fourth Dynasty Pyramids’, Ankh 17, pp. 41-57. Miatello, L. (2013), ‘Problem 10 of the Moscow Mathematical Papyrus: Corrupted Part or Technicality?’, GM 237, pp. 55-70. Mojsov, B. (2005), Osiris. Death and Afterlife of a God, London: Blackwell Publishing. Osing, J. (1994), ‘ZuSpruch 534 der Pyramidentexte’, in C. Berger, G. Clerc and N. Grimal (eds. ), Hommages à Jean Leclant, 1, IFAO: Cairo, pp. 279-284. Petrie, W. M. F. (1883), The Pyramids and Temples of Gizeh, London: Field and Tuer. Petrie, W. M. F. (1892), Medum, London: David Nutt. Petrie, W. M. F. (1925), ‘Surveys of the Great Pyramids’, Nature, pp. 942-943. Petrie, W. M. F. (1940), Wisdom of the Egyptians, London: British School of Archaeology in Egypt and Egyptian Research Account. Petrie, W. M. F. (1990), The Pyramids and Temples of Gizeh - 2nd Edition from 1885 Republished in a New and Revised Edition with an Update by Zahi Hawass, London: Histories and Mysteries of Man Ltd.
Ramsay, C. B., Dee, M. W., Rowland, J. M., Higham, T. F. G., Harris, S. A., Brock, F., Quiles, A., Wild, E. M., Marcus, E. S. and Shortland, A. J. (2010), ‘Radiocarbon based dating for early Egypt’, Science 328, Issue 5985, pp. 1554-1557. Ritner, R. K. (2008), The Mechanics of Ancient Egyptian Magic, Chicago: The Oriental Institute of the University of Chicago. Rossi, C. (2003), Architecture and Mathematics in Ancient Egypt, Cambridge: University Press. Smyth, C. P. (1864), ‘On the Reputed Metrological System of the Great Pyramid’, Proceedings of the Royal Society of Edinburgh XXIII, pp. 667-706. Smyth, C. P. (1867), Life and Work at the Great Pyramid During the Months of January, February, March, and April, A.D. 1865, 3 Volumes, Edinburgh: Edmonston and Douglas. Smyth, C. P. (1874), Our Inheritance in the Great Pyramid, London: W. Isbister & Co.
Smyth, C. P. (1880), Our Inheritance in the Great Pyramid, 4th Edition, London: W. Isbister & Co.
Smyth, C. P. (1884), New Measures of the Great Pyramid, London: R. Banks. Tallet, P. (2016), ‘Un aperçu de la région Memphite à la fin du règne de Chéops selon le “journal de Merer” (P. Jarf I-III)’, in S. Dhennin and Cl. Somaglino (eds), Décrire, imaginer, construire l’espace : toponymie égyptienne de l’Antiquité au Moyen-Âge, Cairo: IFAO, pp. 13-30. Tallet, P. and Marouard, M. (2014), ‘The harbour of Khufu on the Red Sea Coast at Wadi al-Jarf, Egypt’, Near Eastern Archaeology, 77:1, pp. 4-14. Taylor, J. (1859), The Great Pyramid: Why was it Built? And Who Built it?, London: Longman, Green, Longman, and Roberts. Verner, M. (1997), The Pyramids: Their Archaeology and History, Atlantic Books. Wilkinson, G. (1841), ‘Manners and Customs of the Ancient Egyptians’, Chapter XI, vol. I, 2nd series, London: John Murray. Wilkinson, R. H. (1987), ‘The Coronational Circuit of the Walls, the Circuit of the HNW Barque and the Heb-Sed “Race” in Egyptian Kingship Ideology’, JSSEA 15: 1, pp. 46-51. Zapassky, E., Gadot, Y., Finkelstein, I. and Benenson, I. (2012), ‘An Ancient Relation between Units of Length and Volume Based on a Sphere’, PloS One 7:3, pp. 1-6. Ex University of Glasgow, Scotland and Co-Editor of the Journal of Ancient Egyptian Architecture. Ramsay et al. (2010), p. 1556. See Tallet (2016) and P. Jarf I-III, and Tallet and Marouard (2014). Led by Pierre Tallet of the University of Paris IV-La Sorbonne and Gregory Marouard of the Oriental Institute of Chicago. Translation by the author from the French. The ancient name of the Great Pyramid of Khufu translated into English. Thanks to Margaret Maitland, curator of the Ancient Mediterranean at the National Museum of Scotland, and Alan Jeffreys, vice chair of Egyptology Scotland for help in completing this research project. This paper is dedicated to the members and committee of Egyptology Scotland which celebrates its 15th anniversary this year. Thanks also to Ghi Stecyk for help producing the illustrations, Franck Monnier for the animations on the website version, and my peer reviewers for their constructive feedback, which I have attempted to incorporate and respond to. Petrie (1885), p. 93; Lightbody (2008). This is impossible to verify as the vast majority of core blocks remain inaccessible. Petrie (1883), p.179; Lauer (1931), p.59. See also cubit values in Wilkinson (1841), pp. 24-34. Lepsius (2000) gives 0.525 m. See also Arnold (1991), p. 251. This value is derived from measuring parts of the finest structures built with lengths of multiples of cubits, and then subdividing the result by the assumed number of whole cubits that were intended by design. This is why a mean value can reasonably be quoted to a precision of less than 1 mm. It is not the length of any one rule or the precision of any one measurement. It is not known how this level of consistency was maintained in practice, but accurate copying of fine reference rules may have been supplemented by the use of reference lengths of 10 or 20 cubits, marked out on the ground, against which rules were checked and re-checked and which did not vary. Such reference lengths and longer measuring rods of 10 or 20 cubits in length may have been used for setting out larger monuments. The close correspondence between the standard value derived from the dimensions of the ‘king’s chamber’ and the ground plan of the Great Pyramid indicates that the Old Kingdom Egyptians were able to attain a level of accuracy equivalent to 1 part in 1000 using methods along these lines. In practice this meant that a mean accuracy of better than 1mm per cubit could be maintained in the highest quality cases, as seems to have been the case for the overall base side lengths of the Great Pyramid which vary by less than 70 mm over 440 cubits. Maragioglio and Rinaldi (1965), p. 80. Lehner (1997), pp. 122, 123. Of the six examples involving sekeds on P. Rhind, 56, 57, 58, 59a, 59b, 60, four show the seked calculated from the base and height, 56, 58, 59a, 60. The other two problems calculate the height from the seked and base dimension, but these two, 57, 59b, are in fact reverse calculations of problems 58 and 59a. This implies that the normal procedure was to calculate the seked from the chosen base and height dimensions. It is also likely that whole number seked results were preferred, to facilitate measurement and construction. Some interplay between the different factors would be expected during the design phase to find an optimum solution, and artistic/ritual symbolism would have been one of those factors. It is clear, however, that the scribes were able to calculate fractional sekeds if required, at least during the Middle Kingdom. Verner (1997), p. 70; Mojsov (2005), p. 26; Edwards (1979), p. 269. Petrie (1883); Petrie (1892); Petrie (1925); Petrie (1940), p. 30; Petrie (1990). Note that the latter publication is a 1990 reprint of his 1885 revised version of his 1883 survey report. The 1885 version in fact contained the most extended discussion of this issue. Cole (1925); Dash (2016). The length of each side was 440 cubits. Rossi (2006), p. 67. Also see the addendum after the conclusion of the present article for an extended excursus regarding the evidence from mathematical papyri. Vizier Ankhhaf, half-brother of Khufu, is also mentioned in the Al-Jarf papyri and may have been involved in the construction of the Great Pyramid. His period of activity is situated chronologically at the end of the reign of Khufu. A fine bust of Ankhhaf is now in the Boston MFA, 27.442. He was buried in tomb G 7510 at Giza. Similarly, a fine statue of Hemiunu, thought to have been the architect of the Great Pyramid and a grandson of pharaoh Sneferu, is now in the collection of the Pelizaeus Museum in Hildesheim, Germany, PM 1962. It was found in his tomb at Giza, G4000 in 1912. This large mastaba is located at 29°58'45"N, 31°7'47"E.
Ritner (2008), p. 68. See also papers by Anthes (1961) and Brovarski (2009). Faulkner (2007), p. 201, 202; Osing (1994). See Gillings (1982) for an analysis of the P. Rhind examples relating to circles, and see Chace (1929) for detailed images and transcriptions of the examples. For the possibly related but very unclear P. Moscow 10 example see Cooper (2010) and Miatello (2013). Other researchers have noted the repeated occurrences of the numbers 7, 11, 22, 44 in other aspects of the architecture of the early Old Kingdom pyramids. See the interesting article by Miatello (2008) who also related these numbers to circles and the solar circle in particular. See Zapassky et al. (2012). Published under Creative Commons CC-BY-NC 2.0 - 2016 - Contact Us - Follow Us !